With Maidan (2014), Ukrainian director Sergei Loznitsa made a stunning document of recent events, giving the sensation that history was being freshly minted and world-changing events taking place amidst the stink of burning tires and the febrile excitement of new hope. 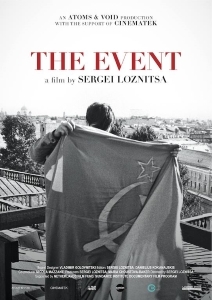 Although The Event (2015) is set in Russia and relates to a moment almost a quarter of a century in the past, the relationship between the two films speaks all the louder for not being spoken. The film is a mirror held up to the Russian people as if to say “You had your Maidan, now let us have ours”. The event of the title was the failed coup d’état that took place in August 1991. Shocked by the pace of President Gorbachev’s reforms and seizing on the opportunity presented by the Premier’s untimely summer holiday, Communist hardliners staged a Putsch. Gorbachev was detained, the TV and radio was seized and Tchaikovsky’s Swan Lake blared out. Using only black and white archive footage and no commentary or present day talking head interviews, Loznitsa allows the events to unfold in all the uncertainty of their initial time. Protesters wander across Leningrad’s Palace Square in the summer sunshine, radios are tuned into, music plays and gossip is overheard. Is Gorbachev already dead (as rumour has it)? Are the tanks coming? Patrols are organised and the politicians rush from place to place trying to catch the tone of the people, themselves desperate for news. Deep within they must also be making their own secret calculations: they, more than any, well aware of the grave risk of being on the wrong side of history. We glimpse a young (if he was ever young) Vladimir Putin getting into a car, his face betraying a look of startled trepidation. Putin had retired from the KGB to pursue a career in local politics in Leningrad and had been given a mid-ranking position by Mayor Sobchak. It’s a only a second in the film but it feels like the ghost of the future is looking at you. Barricades are erected and Yeltsin begins to emerge as the man around who the people will rally. “We don’t want drunkards,” a voice shouts, admonishing the people to what the Communists might once have called “revolutionary discipline” but now the revolution is one that will sweep the communists from power. There’s excitement, fear but also boredom as ultimately a revolution involves a lot of hanging around once you’ve printed your banners and turned over a couple of buses. A narrative begins to gather pace as the politicians recognise that the time might just have come and the council meetings become increasingly strident against the coup and for reform. Sobchak addresses the people leaning precariously from an upper storey windowsill while a telephone insistently rings in the background. The changes perhaps are already evident in the crowd. A man in a Coors cap raises his fist in defiance, as a sea of fists are raised around him. And yet even as we are swept up we cannot help feeling admonished by the hopes of a people that have been disappointed and to some extent betrayed. An elderly politician tells the crowd that Russia must learn to no longer be “the Big Brother to the Baltic states and ex-Soviet republics but must also be the loving sister.” The old hammer and sickle flag is taken down from the government buildings and the Communist Party records are sealed to lie in wait for an investigation, a truth and reconciliation which will not actually take place. Like all history, The Event is a record of lost opportunities, but with its black and white photography and Loznitsa’s eye for a moment of intimate thought even in the maelstrom of change, this is a riveting, sober and elegiac documentary.